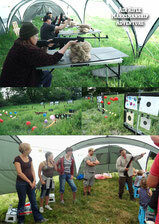 To develop and promote a safe & responsible interest in the sport of air rifle target shooting. We use fun & interesting targets specifically designed to enhance your enjoyment and understanding of the sport of shooting. We want to maximise your time on the range actually shooting, so we have designed this adventure so that the theory is done on the range, meaning that once you have demonstrated an understanding of the safety procedures and commands you can, under instruction, move straight on to handling and using your rifle. All our marksmanship adventures have a maximum of 9 people shooting. Training in small groups means each shooter gets plenty of 1-to-1 tuition. This skilful sport can be enjoyed by anyone, able or disabled, young or old. All you need to do is concentrate and you'll be hitting the bulls eyes by the end of the day. We offer instruction on the key principles of Air Rifle Target Marksmanship such as rifle safety, range safety and proven practical skills. What you learn with us will give you a solid foundation for further shooting adventures.